Yellow Thai Curry with Chicken (Gaeng Karee Gai) | Love.Food.Asia. The Yellow Thai Curry is one of the the major currys of Thailand. This curry is richer and creamier than other Thai curries. The chicken (Gai) is cooked in a creamy coconut sauce. 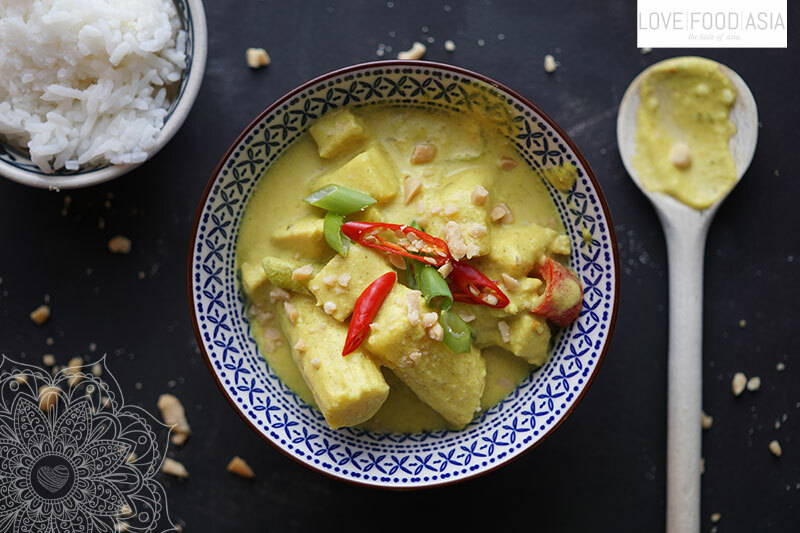 The yellow curry is made within a few minutes and so it is a perfect midweek meal. Cut chicken, potatoes, sweet pepper and onion into bite-sized pieces and pre-boil potatos for 5 minutes. Remove stunk of the kaffir lime leaves and cut the leaves into small stripes. Set aside. Mix half of the coconut cream with chicken and currypase in a sauce pan and bring to a boil. Simmer chicken until it is cooked through. Add all remaining ingredients and simmer for 5 more minutes. Season with fish sauce and serve with kaffir lime leaves, chilis and rice.